These handmade leather greaves are crafted from the finest quality 13/15 ounce leather and accented with four steel O-rings, not only for looks but for added protection. The initial thickness of the greaves (about 1/4 inch) combined with steel rings and the thickness of the straps will give your shins unsurpassed protection! The rings are secured to the greaves by black 3/4 inch leather straps. 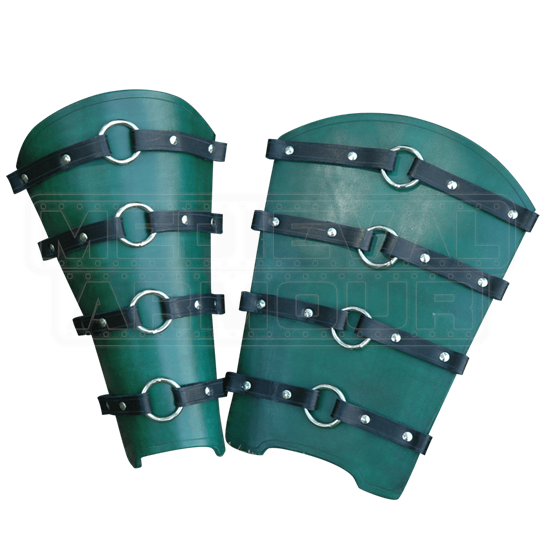 The leather straps form a loop at the edge of the greaves, thus creating the method in which these greaves close, we call them leather speed lacers. Speed lacers are pretty easy to secure by yourself, and once they are on, they provide quite a comfortable fit. Two long leather laces are included. These greaves are sold as a pair. When selecting your colors, the color listed is for the main color of the greaves. The straps will always be black.